The fun does not stop once the strategy summary is distributed and the initiatives list is complete! 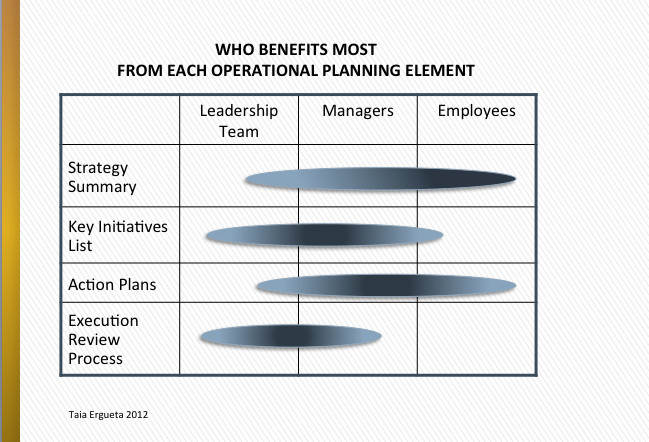 Here is the second and last section of the Taia Ergueta Minimum Pain-Maximum Gain Operating Planning System. This is where the functional or project teams lay out what they will actually do. There will be groaning, but persevere. Writing it down gives you a prayer of a chance that everyone is mobilized around a scope, a pace, and interim milestones that will actually achieve the desired outcomes. Without this, it is really easy to go forward with all good intentions, have 3 quarters of highly upbeat review meetings at which actions taken are reported proudly, and then, in the 4th quarter, notice that we are not actually going to produce the results. Explanations for the gap will abound. The fact is, if you teams can’t describe at least one way to accomplish the objectives and let everyone see and critique that, your expected results have a high chance of being road-kill. 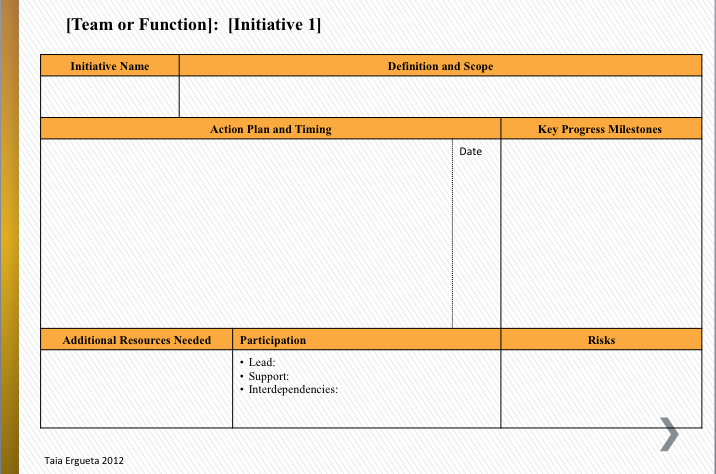 Here is a simple template for the action planning. 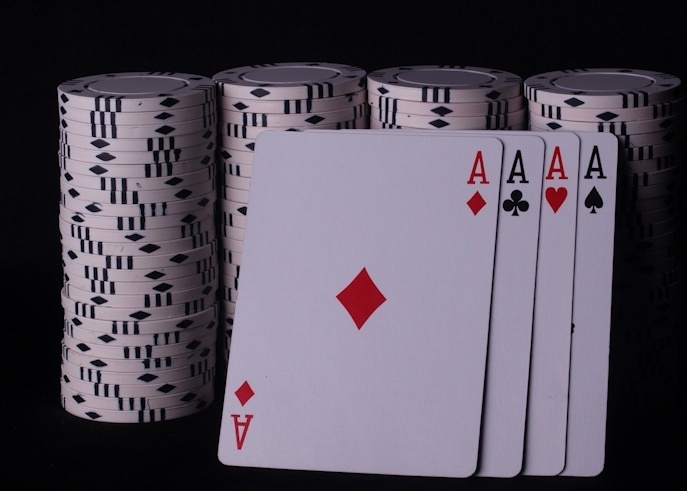 Each function or team fills one out for each major initiative. The dates and milestones associated with the actions are the items that are reviewed at the progress review meetings. 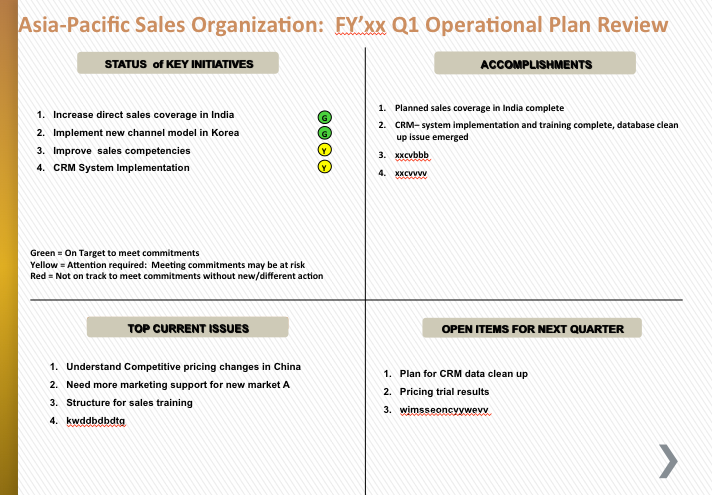 Here is a one page template for reviewing a function, or team operational plan. The top left quadrant simply shows what is on track or off-track. The top right gives highlights of what has actually been accomplished. The bottom left indicates what issues are being addressed. This should be a rich part of the discussion including troubleshooting what the team is doing to correct the problems, requests for assistance, etc. The bottom right is a place for the team to note key things that will come up in the next quarter and/or the next review. Here is how the 4 parts of the TEMPMGOPS serve different parts of your team. The darker the shading, the more important the benefit.